Be a part of the glitz and glamour at this year’s Mardi Gras and stay right in the heart of Sydney’s CBD at Fraser Suites Sydney. To celebrate the festival’s 40th anniversary, Fraser Suites Sydney are offering 15% off their best flexible price when staying a minimum of two nights between 2 – 4 March 2018. The hotel’s prime city location gives guests the best access to the colourful festivities and events surrounding Mardi Gras, including the infamous parade on Saturday 3 March. Located on Kent Street, the hotel is only a strut to lively Oxford Street and a chasse to Town Hall Train Station. When the heels need to be taken off, guests can recharge their party feet at the indoor swimming pool, spa, steam room and sauna. Guests can find plenty of restaurants nearby including Asian cuisine hotspot, Regent Place, located underneath the hotel or a plethora of options a short walk away at Darling Harbour. Fraser Suites Sydney is at the epitome of stylish living. 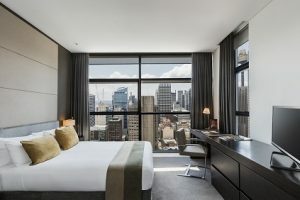 Designed by internationally renowned architect, Sir Norman Foster and ideally located within the Kent Street Precinct, Fraser Suites Sydney offers luxury apartments in the hub of a vibrant shopping and entertainment district. The 201 fully furnished luxury residence include Deluxe Studio, One Bedroom, Two Bedroom and two Penthouse Suites stylishly furnished for luxury accommodation. Prices start from $277 per night and booking dates for this special offer are 2 – 4 March 2018, using the promo code MARDIG18. For more information see Fraser Suites Sydney’s Offers Page.